Roughing it in the Bush Research Papers look at a book Susanna Moodie about the reasons why people emigrate. 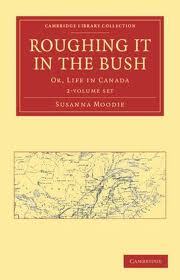 Research papers on Susanna Moodie's book Roughing it in the Bush, begins with an explication of why people emigrate. You can focus on any aspect of Moodie's book when you need research on Canada or the Canadian population, have the writers at Paper Masters help. By 1830, many Europeans, tired of the hierarchy of social class and conformity began emigrating to Canada, with these ideologies in mind. Although travel literature about Canada during this time period espoused the promises of a wonderful land filled with fertile ground, commercial advantages, close proximity to the mother land and little taxation, the literature invariably failed to mention the more subtle uniqueness of Canada: the fact that it was highly rural and undeveloped, that no form of urbanization existed and many modern conveniences readily available in Europe would not be available in Canada for a number of years. While the travel literature of the time was successful and bring flocks of Europeans to Canada, many ended their journeys with disillusionment and despair. Although the plot of Moodie’s book centers around her journey to Canada in 1832, Moodie makes a number of observations about the people around her. Even though her observations are not overt, what she writes about various classes ethnicities and genders, clearly shows the unique diversity to people that were emigrating to Canada during this time period. One of the first observations to made by Moodie is the manner by which the lower class—or steerage, as they were referred to at the time—reacts upon their arrival in Quebec. Arguably a number of people on the ship were seeking a better life for themselves. However, it seems that when the steerage landed in Canada, their first objective in solidifying a new life for themselves was to castoff their old social class status and attempt to appear more affluent to the social elite in Canada. Moodie also makes mention of this phenomenon later in her text as she notes that when the servants, or any emigrant of lower social class enters Canada, they believed that they were free: “They fancy themselves not only equal to you in rank, but that ignorance and vulgarity give them superior claims to notice, The demand in terms the highest wages, and grumble at doing half the work, in return, which they cheerfully performed at home”. In short, the journey to Canada has left many from the lower class to believe that they were worthy of the same privileges and luxuries of the middle class. Further, if those from the middle class refused to accommodate them, they became angry, disgruntled and often refused to work. War on the Middle Class research papers examine its affects on the American dream, with a specific source requirement. Paper Masters writes custom research papers on Roughing it in the Bush and look at a book Susanna Moodie about the reasons why people emigrate.